Calling all Sarah Richardson & Tommy Smythe fans! With the first season of Sarah 101 wrapped up, what better way to celebrate than having a Sarah & Tommy giveaway! 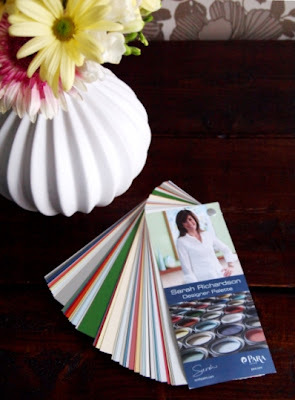 And its a doozy - enter for your chance to win a Sarah Richardson Designer Palette by Para Paints fan deck personally signed by Sarah and Tommy! Awesome, right?! Sarah has always been known for her keen sense of colour and I will tell you that this collection is spot on. I just painted my living room in Cashmere which Sarah describes as "the ultimate grey" - and she is right, its the perfect grey! With this paint deck in your hands, there's no telling what you'll be inspired to do in your own home! Receive one entry for leaving a comment below. Receive one entry for becoming a follower; leave a separate comment below to let me know. If you're already a follower, leave a comment below. Receive one entry if you tweet about the giveaway. Make sure to include my twitter @ramblingreno so I can keep track. The contest is open to Canadian and US residents. You have until 10pm EST April 3rd to enter. The winner will be drawn from all entries using Random.org and announced on April 4th. Good luck! !